Please share also if you have improvised kits you use/used for the love of music. I have these practice pads which I love very much because these were given by my cousin na pinasadya nya somewhere using parang cork on top, then heavy wood for the base. He gave me these very long time ago when he found out that I had no where to hit my sticks for practice. I was surprised he gave me 3 pieces and I don't know kung may natira sa kanya. I have this imporvised guitar neck made of good lumber na natira lang sa pagrenovate ng bahay ng lolo ko around 6th grade. Lolo ko ang nag shape ng neck (based sa neck ng mga lumanog guitars noon). 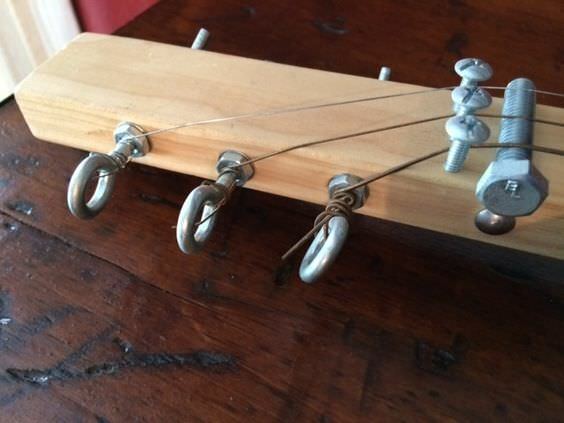 Fret wires are made from umbrella frame. He did even followed the gauges of the strings. The tuning machines were like this one. Sayang wala akong photo pero that was the most memorable gift I received from my lolo. san galing Sir yang photo na yan? But most likely ganyan na rin ung guitar m? Sana natitira pa para picturan mo uli. Nakakatuwa namiss ko lolo ko. I have an improvised drum set before, way back 2003-2005, marami kaming lata ng Danish cookies before so naisip ko "i can make some sort of practice pad look-alike with these" So may 6 pcs na danish cookie can ako for the Snare / floor toms / rack toms and for the bass drum. for the pedals well luckily meron akong legit na bass pedal and HH stand (sold already) for the cymbals kumuha ako ng takip ng Nido (those circular-shaped lids) ayun. dun ako nag practice. Had 1 almost the same, pero lata ng selecta then nilagyan ko ng tela yung butas at sangkatutak na rubber band para humigpit. tapos hats pa e tansan na pinag sama sama. at alam mo na kung ano ang cymbals. kaya galit sa akin ni ermats dati. Wala ng takip mg caldero. sa google lang. most likely ganyan yung tuning pegs. Very nice. Parang mas maaappreciate m talaga pag improvised na nga bigay pa.
may videos sa youtube na tugtugan sa kalye gamit na set improv lahat. pedals lang yata ang tunay. and yea, i remember when i used to hang out with a bunch of old 'tallica fans na yung buong drum set(bukod sa hi hat at pedals) ay improvised. yung amps ay panasonic na karaoke na umiilaw pa yung bass dome to indicate peaking. some worn out DOD distortion pedal, upuan, mic na buka na yung dulo, at sangkatutak na desire to play the music they want - you get a three-piece combo playing old metallica tunes! Those days. Matagal na nga cguro kaya hindi napicturan. Sayang. Ganda sana makita mga posts nyo. Bad Behavior has blocked 35164 access attempts in the last 7 days.